Robert B. Harbertson was a General Authority of The Church of Jesus Christ of Latter-day Saints. He was sustained as a member of the First Quorum of the Seventy in April 1984 and when the Second Quorum of the Seventy was formed, he and other Seventies who had been called to a five-year term of service were transferred to that quorum. He was released in October 1989. 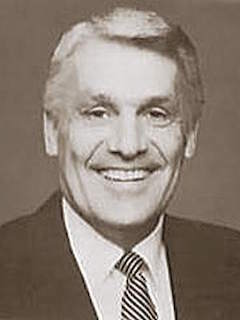 Harbertson served in the Church in many other callings, including bishop, member of the General Aaronic Priesthood Committee, president of the California Fresno Mission from 1975 to 1978, second counselor in the Young Men general presidency, director of the Temple Square Visitors’ Center, and president of the Winter Quarters Nebraska Temple. Harbertson was born April 19, 1932, in South Ogden, Utah. He spent two years in the US Army and worked as a sales engineer before he became president of THB, Inc., a family owned business. He graduated from Utah State University and was a basketball star whose shot during a tournament at Madison Square Garden won the game and put him in the news. He and his wife, Norma, were the parents of five children. After her death, he married Rene Rhead. He passed away on November, 18, 2014. This page was last edited on 29 March 2017, at 22:29.